honolulu secular weddings | Affordable secular-themed weddings in Honolulu! Affordable secular-themed weddings in Honolulu! Whether it’s a last minute wedding, a tight budget wedding, an LGBT wedding, an atheist wedding or a wedding that just needs to break tradition, I understand that taste/situation changes from person to person, couple to couple. I’m here to accommodate your personal wedding ideas to make a memorable experience you’ll cherish for the rest of your lives. I will officiate a custom secular-themed wedding ceremony to suit your needs at an affordable rate. You take care of any permits or location permissions for the venue. My “Officiant-only” rate is $60 for quick, casual small weddings (under 10 in attendance) and $100 for larger weddings (Honolulu metro proper – $150+ for other areas). Formal “Officiant-only” weddings begin at $120 small weddings (under 10 in attendance) and $300 for larger weddings (Honolulu metro proper – $350+ for other areas within a reasonable distance). No Officiant/Photographer combo packages currently available. Hawai’i state law requires that couples be at least 18 years old with state-issued IDs. Marriage certificates must be obtained from the Department of Health prior to ceremony (cost is $60 with a $5 application processing fee here or in person at: Room 101 [1st floor] of the Health Department Building, 1250 Punchbowl St.). 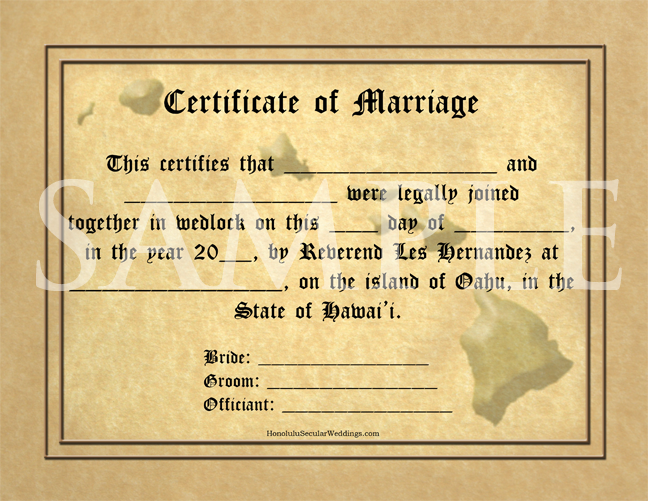 A Hawai’i marriage license is good only for 30 days counting the date of issuance. Hawai’i does not require witnesses. For more on Hawai’i State Marriage and Civil Union Law, see this link. If you are planning a wedding or civil union on any beach you must obtain a permit from the State of Hawai’i here (roughly $20-$25). Contact me with the subject header “WEDDING” at honolulusecularweddings@yahoo.com. *Minimum deposit of $25/$50 (depending on wedding service) required to hold dates, payable to this email. Posted in Uncategorized on August 7, 2014 by honolulusecularweddings.